Tech’s Capital Planning and Space Management Office, responsible for maintaining and developing campus facilities, has plans to expand landscapes around campus in the coming months. The proposed changes stem from guidelines set forth in the 2011 update to the Landscape Master Plan. 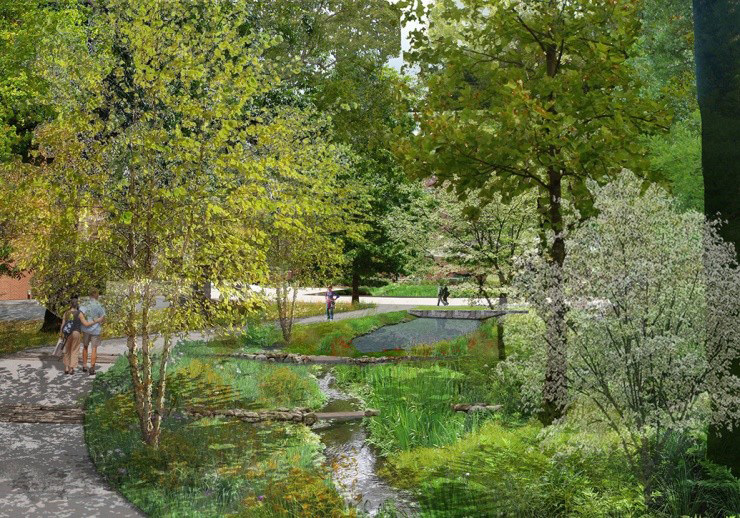 The Eco-Commons, part of the Landscape Master Plan’s goal to make campus a Performance Landscape, will receive and manage storm water from the whole campus, potentially reducing the amount of storm water that leaves campus and enters Atlanta’s sewer system by 50 percent. The next portion of the multi-phase Eco-Commons project is expected to be completed by early 2019. According to the 2011 Landscape Master Plan, the Eco-Commons will run throughout the campus and “mimic a forested watershed” in order to naturally retain ground moisture while also guiding water flows into an underground reservoir at its northern end. The changes will revive old natural water pathways that were removed when the Atlanta sewer system was developed. human landscape, governed by the social activities and experiences of people. “The landscape becomes the fabric that ties everything together,” said Gregory. “We get a lot of different building styles over the years, which is an interesting development in and of itself, and the landscape can be the one thing that weaves everything together. ”In order to display the technical feats of the Eco-Commons project to the public, the Capital Planning and Space Management Office worked with the IMAGINE Lab to create the GT Eco-Tour phone app, an interactive map that allows users to virtually explore campus. Wertheimer and Gregory urged those interested in learning more about or becoming involved with the Eco-Commons project to contact them, especially as they move into the planning stages of how the Eco-Commons will mesh with the vicinity of the upcoming Living Building.